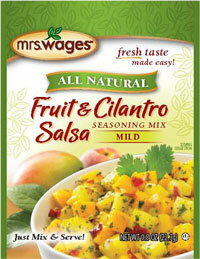 Mrs. Wages Fruit & Cilantro Salsa Mix makes citrus juices join red and green bell peppers, sweet shallots and fragrant cilantro in this mild salsa seasoning, perfect with everything from pita chip or a main entree dish. .8oz. Combine mix contents with fruit and water in a large mixing bowl Toss lightly. Let stand for 10 minutes or cover and refrigerate until ready to use. Serve with pita chips. MALTODEXTRIN, DEHYDRATED VEGETABLES (BELL PEPPER, SHALLOTS, CILANTRO, ONION, GARLIC, JALAPENO), SALT, SUGAR, LIME JUICE, SPICE, CITRIC ACID, RED PEPPER BLEND (RED PEPPER, DISTILLED VINEGAR, SALT), NATURAL FLAVOR.